In the 1890 Census, the city of Tacoma had a population of 36,000. History books called it the “city of destiny”, and the economy was booming. In 1891, after several years of “boom” the economy slowed. There were three Catholic churches in Tacoma at the time; St. Leo’s, the oldest, was located at South D and 11th Street; Holy Rosary, at its present location, and St. Mary’s, at South Yakima near 23rd Street. The churches were under the leadership of the Most Reverend Aegedius Junger, Bishop of the Archdiocese of Nisqually. Because of the close proximity of the three churches and the recognized need of a church in Old Town, the Bishop gave permission to dissolve St. Mary’s and to establish Saint Patrick Catholic Church in the Old Town section of Tacoma. The announcement was made at an early Mass on Christmas Day, at St. Mary’s, that the next Mass would be celebrated at the newly established Church of Saint Patrick. The first Mass was celebrated on December 25, 1891, in a two-story building owned by Campbell and Powell, attorneys located at Starr Street and Tacoma Avenue. In the spring of 1892, a small 30’ by 40’ frame church was built on the corner of Tacoma Avenue and Starr Street, on property leased from the Tacoma Land Company. The monthly rent was $10. The building was built with lumber donated from the Old Tacoma Mill and volunteer labor directed by Messrs, Harrington and Smith. 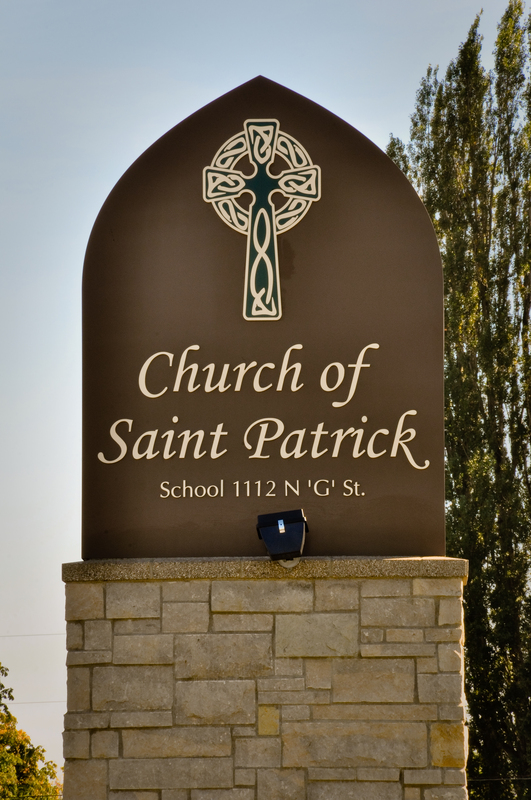 The newly completed church received a statue of St. Patrick from the Timothy Murphy family. This statue and the statue of St. Anthony were blessed in the church on March 17, 1892. The small church had a main altar and a small side altar of our Blessed Lady. The twelve pews provided more than adequate seating for the fewer than fifty parishioners; of these six were men. Miss Josie Mahoney, later known as Mrs. J. C. Murphy served as the first organist and choir director for the church. The modest wooden building also served as the first parish school starting in September 1893. The Pastor, Margaret Casey and Josie Mahoney were the teachers. At this time The Ladies Altar Society was established. The men formed the Elmira Club to secure funds for the maintenance of the church. The League of the Sacred Heart was also established for the spiritual advancement of the parishioners. In May of 1893, the economy that had been slowing came to a stopped. It was referred to as the “crash” or “panic” of 1893. A large number of businesses closed; many peopled removed their savings from the banks before they closed. The general population, unable to find work or food, lived off the land eating berries and clams! There was no state or local aid available for such emergencies. People with money began buying one-way tickets East. 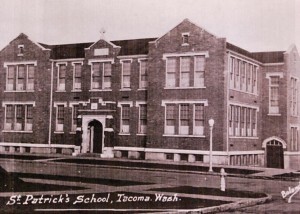 It was at this time that the Dominican Sisters arrived in Tacoma to establish a school for the parish. It was to be the first official parochial school west of the Mississippi River. The Dominican teachers were Mother Thomasina, Mother De Chantel and Sister Aloysius. Mrs. Hanna Oldfield , provided rooms for the Dominincan Sisters in her home at 2714 McCarver Street until they purchased property on the corner of Starr and G Streets for their convent and school. Shortly after their arrival, the church building was physically moved to the Dominican’s newly purchased property after the leased property on Starr Street and Tacoma Avenue was reclaimed by the Old Tacoma Land Company. During these poor economic times, the Parish, under the direction of Father Emonds provided a “soup house” free of charge for all the needy who came for help. In 1899, Father Emonds departed for Germany, due to his failing health. The Rev. LeBlanc, of All Saints Parish in Puyallup, was appointed Pastor, Some of the parishioners who helped in the infancy of St. Patrick Parish were the following: John M.Boyle, John McCann, John Nolan, John Geehan, Pat Finnegan, H. J. Marshall, McNerthney Family, Gus Fufleson, T. Babcock, W. M. Casey, D .D. McDonald, Mrs. George Hill, Mrs. Dennis Coleman, Mrs. L. D. Campbell, Mrs. Anna Oldfield, Mrs. Waldo, Mrs. Donovan. In May of 1899, the property upon which the church stood at Starr and G Streets was purchased from the Dominicans by the parish. The Sisters had purchased the Col. Pinkerton property across the street for the future home of Aquinas, the present site of St. Patrick Catholic School. The cornerstone for the first Aquinas building was laid on June 13, 1899. On the Feast of the Assumption of our Blessed Lady, August 15, 1905, Saint Patrick Catholic Church was destroyed by fire. At this time the sidewalks were made of wood and it was thought that a discarded cigar caused the fire. The Dominicans offered the use of the auditorium at Aquinas, until a new church could be built. In the fall of 1905, lots were purchased for the present church at 12th and J Streets. These lots had been the former sites of the Atkins Memorial Church, which had been foreclosed and torn down after the economic crash of 1893. After purchasing these lots for the new church, Father LeBlanc became seriously ill and resigned. Father Fitzgerald was appointed temporary Pastor. On January 15, 1906, Rev. Joseph F. McGrath became Pastor. He quickly began the construction of the new church, following approval by the Bishop, Most Rev. E. J. O’Dea. Frederick Heath was chosen as architect and P. A. Baillargeon the builder. 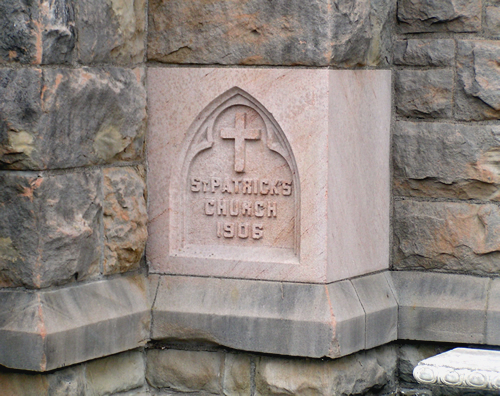 On March 17, 1906, the feast of Saint Patrick, Bishop O’Dea laid the cornerstone. On December 25, 1906, Christmas Masses were celebrated in the basement of the new building, which was still in progress of being constructed. The new church was complete on June 17, 1907. Bishop O’Dea dedicated it on June 30, 1907. In 1908, Saint Patrick Catholic Church purchased the McDaniel family home and property to serve as the Parish Rectory. The old rectory on the corner of Starr and G Streets was sold to the Dominican Sisters, who converted the building into a school for boys, known as St. Edward’s Hall. In January 1915, the Bishop divided St. Patrick into two parishes due to the tremedous growth. The new Parish of Holy Cross was created and the Rev. Milinar was named as its first Pastor. On December 25, 1918, Father McGrath was chosen as the new Bishop of Baker City, Oregon. Father McGrath, celebrated his first pontifical High Mass in St. Patrick Church on March 30, 1919. On April 4, 1919, Rev. W. J. Noonan, the Pastor of the Cathedral in Seattle, was appointed Pastor of St. Patrick Parish. 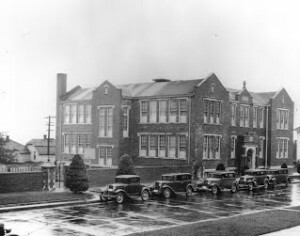 It was under the direction of Father Noonan that St. Patrick School, on the corner of 11th and J Streets, was completed. Its construction had been postponed due to the First World War. On October 12, 1919, the school building on North 11th and J Street was blessed and ready for occupancy. Many dignitaries were present; they included Bishop O’Dea and the Mayor of Tacoma, Mr. C. Ridell. The school remained in this location for 55 years. St. Patrick School accommodated 325 children at the time. Beginning in July of 1920 and continuing for many years, the Parish purchased properties adjoining the school and church in order to increase and improve the two playgrounds for the increasing number of children in the school. Also, during this time an ornamental iron fence was erected between the church and the school. Improvements were also made to the interior and exterior of the church; this included the completion of the church basement, including a sodality room, an auditorium with stage and a kitchen. This area was widely used by the parish and the school. The Parish Fair was held annually from 1921 to 1941. The Fairs brought in large sums of money to help reduce the Parish debt. A State Initiative that required all children to attend public school was defeated in the election of 1924. 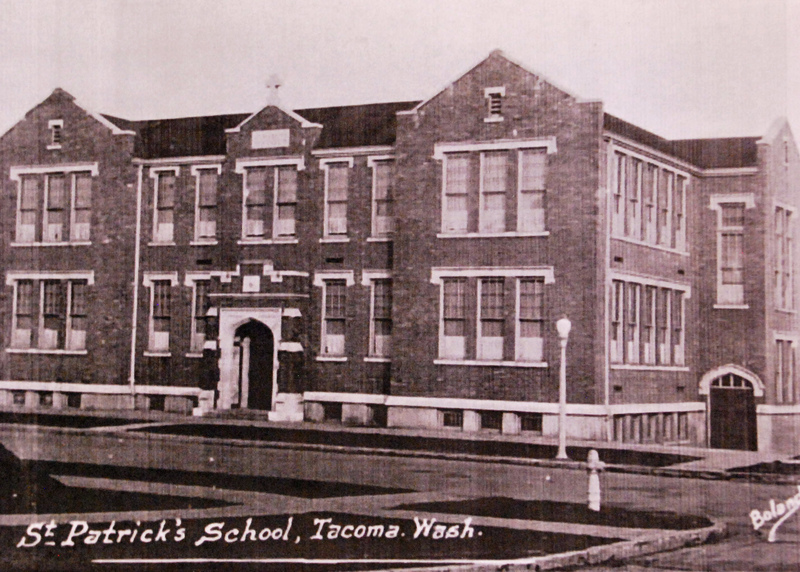 The initiative, funded by the Ku Klux Klan, read “that it be a misdemeanor each day a child attended a parochial school.” Members of St. Patrick Parish and prominent citizens from Tacoma to Seattle worked together to defeat this initiative. On November 25, 1925, Pius XI appointed Rev. Noonan Domestic Prelate. His Solemn Pontifical Mass was celebrated on January 25, 1926 in St. James Cathedral, with Bishop O’Dea presiding. A reception was held at St. Patrick Church on the evening of the Investiture Ceremony. At the reception the children of St. Patrick School presented him with a Gladstone travelling bag to carry his robes of office. The Parish rectory underwent a complete renovation in 1928. The interior was gutted in order to completely modernize the building. It accommodated the pastor, his two associates and visiting priests. The original wooden altars of church were replaced with imported marble altars. June 21, 1929, Rev. Noonan celebrated his Silver Jubilee with Bishop O’Dea presiding The Most Rev. Joseph McGrath was also present. A banquet for 150 bishops and clergy followed the solemn High Mass. Following the death of Bishop O’Dea on December 25, 1932, the Right Rev. Monsignor Noonan was appointed Administrator and Economus of the Diocese, pending the appointment by the Holy See of a new bishop. Rev. Ailbe McGrath was appointed interim Administrator of St. Patrick Parish during Monsignor Noonan’s absence. He remained in Seattle until the Most Rev. Gerald Toughness was appointed Bishop of Seattle on July 31, 1933. In April 1940, St. Patrick Parish purchased the home of the E. R. Gardner family to use as a convent for the Dominican Sisters teaching at the grade school. The following year a convent chapel and a rectory were built on the property. In the same year, a Manual Arts Building was erected and Sister Alma was certified by the State of Washington to teach the boys Manual Arts and the girls Domestic Science. After World War II began, St. Patrick Church no longer held Parish Fairs to raise money. In September of 1942, subscriptions replaced the Parish Fairs, due to the uncertain conditions brought about by the war. It became the responsibility of the Holy Name Society to organize subscription drives to support the maintenance of the church. During this time members of St. Patrick Parish were very active in war-related projects. They volunteered many hours of service with the American Red Cross and St. Joseph Hospital preparing dressings and bandages and working as aides. They also provided for the religious and social needs of the soldiers at Fort Lewis. They were assisted in these efforts by the Knights of Columbus. Following the death of Rt. Rev. Msgr. Noonan on May 1, 1953, the Rev. Edward J. McFadden was appointed Pastor on July 1, 1953. Soon after his arrival, the Mothers’ Club of St. Patrick School was established. In 1956, St. Charles Borromeo Parish was formed to serve the western portion of St. Patrick Church boundary. On September 11, 1957, a new Aquinas Academy for Girls opened for classes. Archbishop Thomas A. Connolly dedicated the building the following month. St. Patrick Parish has assumed financial responsibility of the newly erected building from the Dominican Sisters. This was a period of consistent growth. In the fall of 1974, Aquinas and two other Tacoma Catholic schools — St. Leo and Bellarmine — consolidated to form one high school — Bellarmine Preparatory School. A major redecoration of the church’s interior was begun in 1961. Then interior of the church was severely damaged by the earthquake in 1965. The Rt. Rev. Edward J. McFadden was appointed Domestic Prelate in 1963. His death occurred the following year, May 15, 1964, during heart surgery. Rev. Patrick Clark had served as interim Pastor. His successor, Rev. Thomas J. Pitsch was appointed Pastor on October 15, 1964. The sixties were a period of many changes in the church and also in the nation. The Vatican II Councils were held in Rome, followed by many liturgical changes and a new spirit of ecumenism. Some of the major changes were: altar now facing the congregation, Masses in English, Folk Masses and Home Masses. It was also the time of civil rights marches calling for an end to prejudice, discrimination and segregation. The Parish, led by Archbishop Connolly and Father Pitsch were very active in all these changes. It was also a period of growth for St. Patrick School; its population increased to 650 children. The Very Rev. Thomas Joseph Pitsch celebrated the Silver Jubilee of his ordination at a reception given in his honor on May 20, 1966. The parishioners gifted him with a trip to the Holy Land. The new convent was built for the Dominican Sisters teaching at St. Patrick School and it was ready for occupancy on September 24, 1967. It was at this time that a two-year period of habit experimentation began for the Sisters. Their options were to maintain the habit, modify the habit, or discard it for contemporary clothes. Father Pitsch received the Tacoma Human Relations Commission Award from the City of Tacoma on January 22, 1970. He had served as President of the commission the previous year. On October 22, 1971, Father Pitsch was appointed Pastor of St. John Church in Seattle. On that same day, Rev. Joseph M. Marquart was appointed St. Patrick Church’s new Pastor. The consolidation of Aquinas with St. Leo and Bellarmine schools occurred in the fall of 1974 to form one high school, the current Bellarmine Prepatory School. With the former Aquinas Academy building vacant, St. Patrick Catholic School moved down the hill to occupy it. During the 1970’s the interior of the church was restored and redecorated, the altar was moved forward towards the congregation, the basement reception area and kitchen improved, and a new addition with an elevator was added. This was all done in preparation for the 75th Jubilee of St. Patrick Church in June 1982. On June 2, 1985 Rev. Michael Schmitt replaced Rev. Joseph Marquart. Shortly after his arrival, an Archdiocesan program called Renew was successfully instituted at St. Patrick Church. Renew, a program of spiritual enrichment, encouraged parishioners to take a more active leadership role in parish life. This was particularly important because of the rapidly declining number of parish priests. Father Schmitt’ died on November 10, 1987 in a car accident enroute to a day hike in the mountains. Several interim priests were assigned until Father Tony Bawyn was appointed Pastor on April 10, 1988. After only two years as leader of the Parish, he was sent to a Canon Law studies program at Louvain University in Belgium. In July of 1990, the Rev. Michael O’Neil became the 10th Pastor of St. Patrick Parish. He was a recently retired Navy Chaplain, having served for 25 years. The old St. Patrick Catholic School on “J” Street was demolished in 1992 and the lot was left vacant until it was decided to purpose the property to a grotto area and a rectory for the parish priest. In 1995, Father Seamus Laverty became the 11th Pastor to serve St. Patrick Catholic Church. 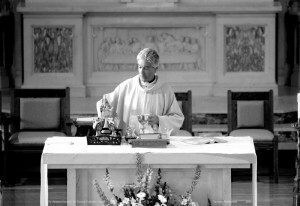 In his 20 years as Pastor, Father Seamus baptized 1,240 children, offered 1,148 First Holy Communions, led 840 Confirmations, presided over 378 weddings, performed 648 funerals and celebrated countless Masses. 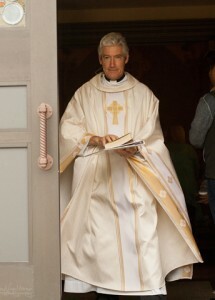 On May 16, 2016, the letter from Archbishop Peter J. Sartain, was read during Mass, announcing that the sacramental needs of the parish would be handled by the Jesuit community living in Orton Hall at Bellarmine Prepartory School in Tacoma, with the gracious approval of the Oregon Provincial, Father Scott Santarosa. 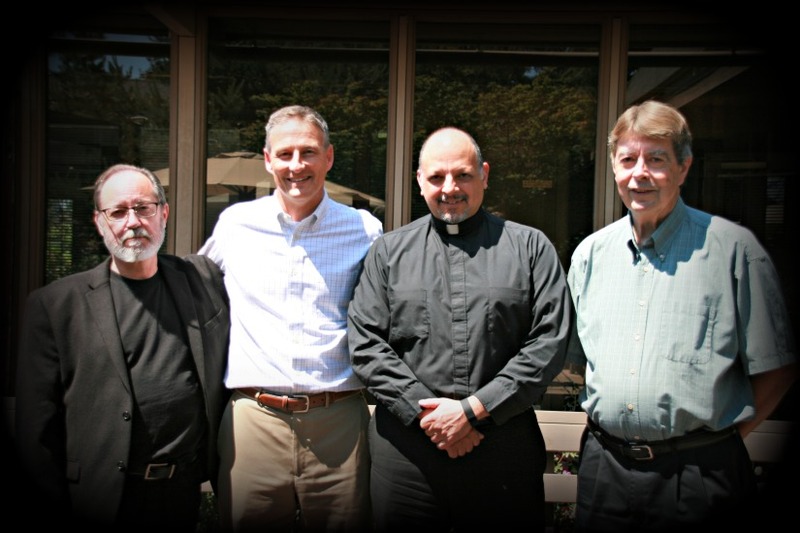 Under the guidance of Father Tom Lamanna, the superior of the Oregon Provincal along with Faher John Fuchs, a very familiar face at the parish, and Father Jerry Graham. The team was charged with caring for the sacramental needs at Mass, Reconciliation, Anointing of the Sick, Weddings and Funerals. Kevin Lovejoy was appointed the Pastoral Coordinator of the parish responsible for overseeing the pastoral, staff and financial needs of the parish. On May 20, 2018 a letter from Archbishop Peter J. Sartain was read at Mass appointing Father David Mulholland as Pastor of Saint Patrick Catholic Church, Saint Rita of Cascia Catholic Church and Holy Cross Cross Catholic Church. 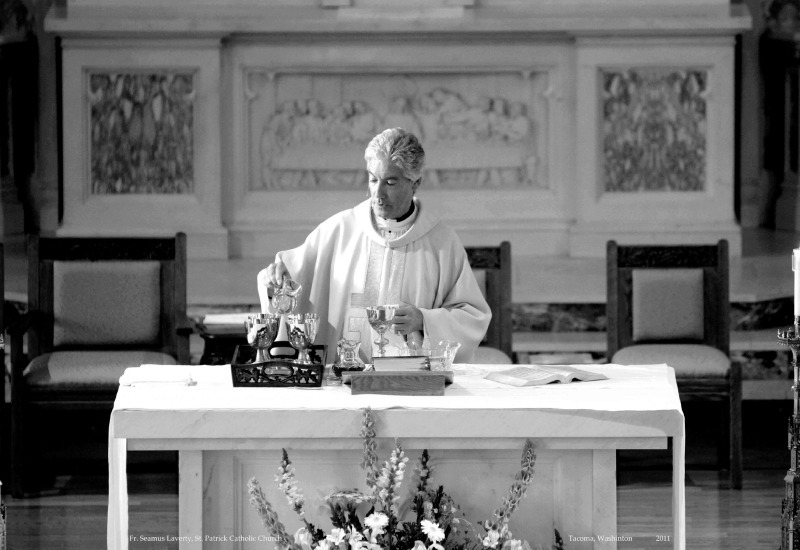 Father David, a Tacoma native who was a parishioner at Saint patrick Catholic Church until he attended Washington State University celebrated his first Holy Mass of Thanksgiving on June 9, 2002. He returns to his home town-roots and the very parish at which he received all of his sacraments. Under the guidance of Father Tom Lamanna, S.J. the superior of the Oregon Provincal along with Father John Fuchs, S.J. a very familiar face at the parish, and Father Jerry Graham. S.J.The team was charged with caring for the sacramental needs at Mass, Reconciliation, Anointing of the Sick, Weddings and Funerals. In September 2016, Father Jim Harbaugh, S.J. temporarily join the team of priests to serve the sacramental needs of the parish while Father Tom Lamanna, S.J. respresented the Oregon Province of the Society of Jesus as the General Congregation 36 in Rome, Italy. In July 2018, Father Jerry Graham, S.J. was appointed the parish priest serving our faith community, with the support of the Jesuit priest. Father Seamus Laverty was the beloved Pastor at Saint Patrick Catholic Church for 20 years— serving the pastoral and sacramental needs of the community until his retirement on June 30, 2015, at the age of 70. Father Seamus— now a Senior Priest spends time on the golf course — a much loved pastime, when he is not in prayer. Although no longer the Pastor of Saint Patrick Catholic Church, his welcome message to the faithful who grace the pews for Mass is still poignant and relevant. If you have never had the pleasure of meeting Father Seamus’ or simply want to learn more about him, his life and his service to the St. Pat’s community, read the Question & Answer column in The News Tribune published on July 13, 2015, shortly after his retirement. Father Seamus has sung the Irish Blessing in prayer over many in the parish community. Parishioners did the same for him at the end of his final Mass as Pastor. She took the beautiful photos and created a video tribute in honor of Father Seamus’ final Mass as Pastor of Saint Patrick Catholic Church & School. This is one of many tributes honoring Father Seamus’ 20 years as Pastor. A few short weeks later, photos collected from parishioners spanning 20 years, compiled into a video slideshow by Shea Cochran, a parishioner and shutterbug who has photographed many school events was shared with the guests at Father Seamus golf-themed retirement party hosted in the gym at Saint Patrick Catholic School on June 20, 2015. In 2011, the Saint Patrick Catholic Church & School undertook the task of creating one logo to represent the church and the school. Prior to this the church and the school each had individual logos. A committee was comprised of parish and school staff, and a graphic designer who was also a school parent. The team decided to build the logo using the Celtic cross on the signage located on the corner of I Street. With the help of a graphic designer the Celtic cross was replicated and served as the anchor for the rest of the logo. After many design changes, reviews and input from school and parish groups a logo was created. A strong, yet calming one of the 40 shades of green existing in Ireland. The arch expands beyond the confines of the Celtic cross and Shamrock to reflect the influence our parish and school have beyond our parish and school community.